For this trip we follow a review by Travel Fish; the savvy bunch for travel in Southeast Asia. 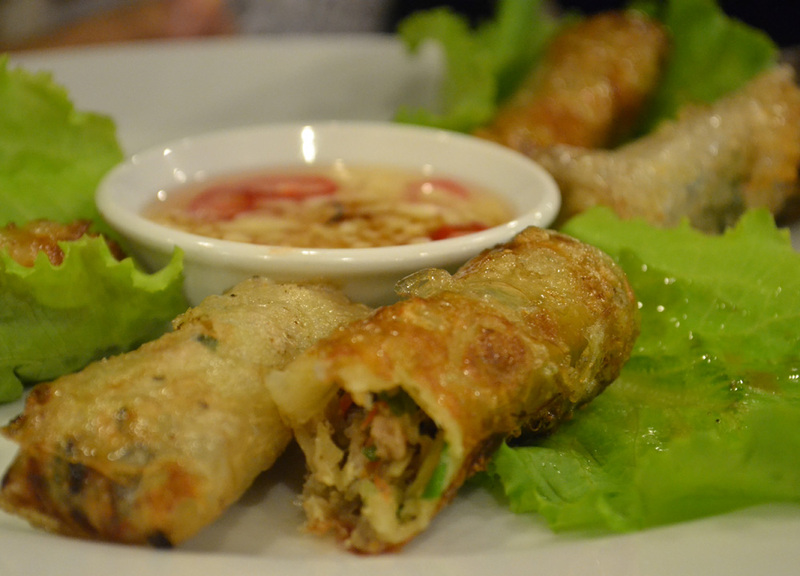 Unfortunately the review was written 5 years ago for Saigon Cafe Tours so this is more of an update. We choose to travel with the flashpacker tour option for the Halong Bay Overnight Cruise (2 days, 1 night). A step-up from the backpacker option but a few steps below luxury. An affordable medium and at $79/person it is hard to grumble. I will therefore keep my grumbling short. On organising the tour we are promised the same boat and itinerary as on the website (email “Yes the same boat and program”). We get neither. Am I surprised? Not really. I think this happens with many tour companies who act more as agents. In situations where tours are over or under capacity the stragglers will likely be fobbed off to the next best fit cruise. It makes little sense to charter a cruise with only 2 passengers. The same goes the opposite to turn away customers once a boat is filled. My advise would be to book in advance (unlike us booking the night before..). Instead of sailing in the majestic Saigon Cafe Junk we are squished on the Lemon Cruise Boat (pictured below). Our spacious king bed quarters swapped for a similar but cramped cabin (again below). I rarely trust brochures moreso with budget travel. 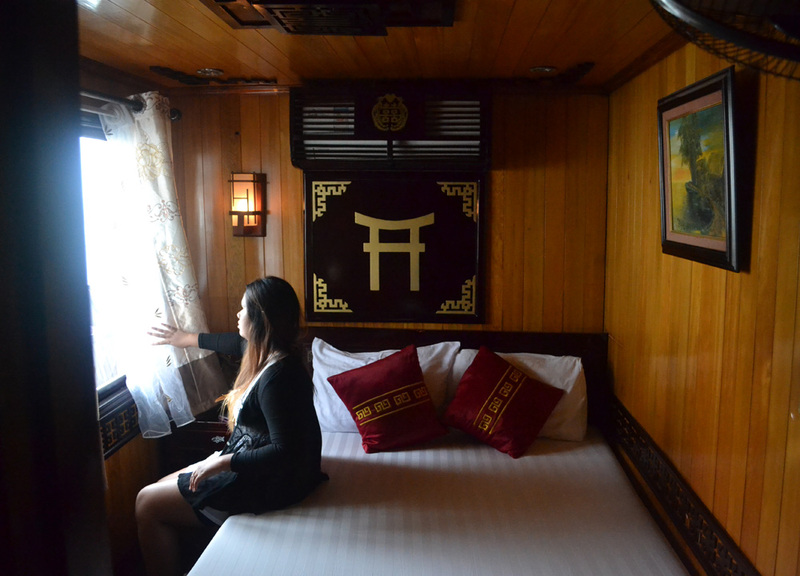 As far as value for money goes our Halong Bay Overnight Cruise was worth it. I think we got lucky here. Enthusiastic, friendly, cheery and small. 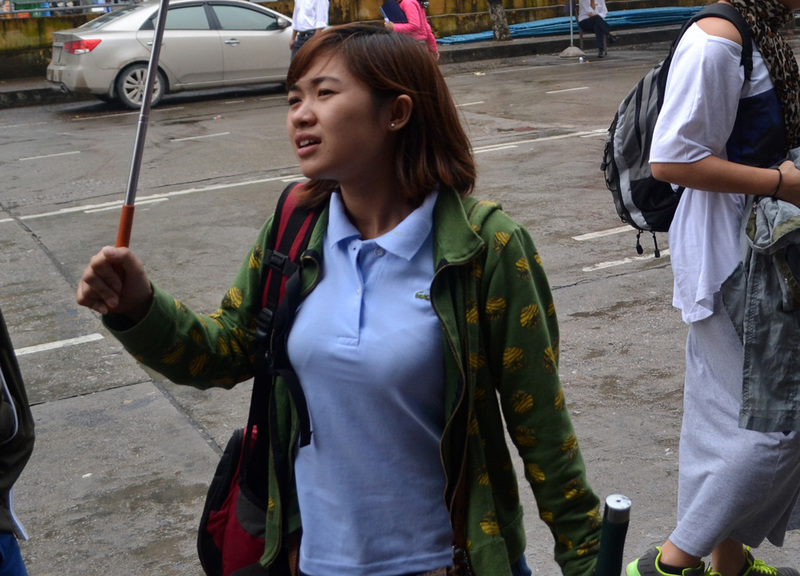 Our pocket sized tour guide; nipping through crowds with her bright blue flag, “I need a flag because I’m small. People don’t see me”. Decent English, not loud, pushy or annoying. Having passed many tour guides along the way I realise how this review could easily have gone in different directions. Fortunately we got Tho (pronounced Toe) for our Halong Bay Overnight Cruise. Toe was with us from the beginning, picking us up from the hotel and giving us the ‘free city tour’ (circling Hanoi to pick up other passengers). Once all on board she hands out the ‘Free Welcome Drink’ a small bottle of water (sneaky?). 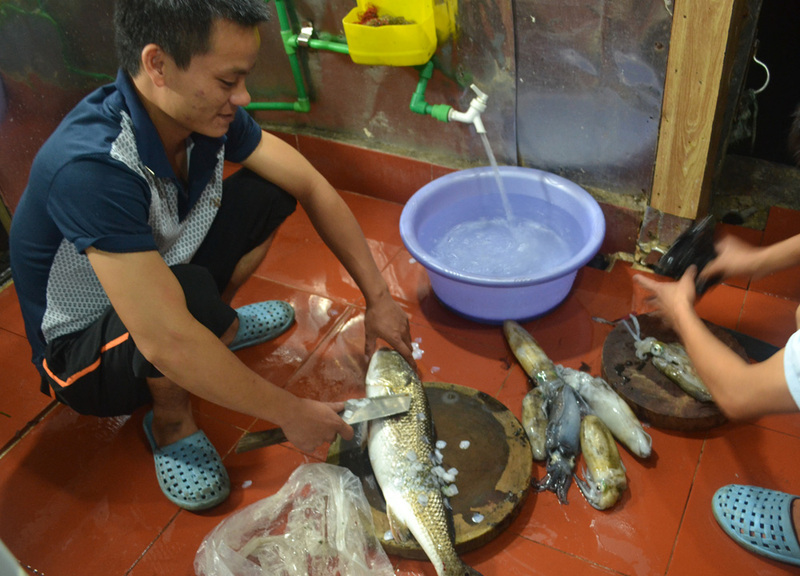 The journey to Halong Bay takes roughly 4 hours with a snack stop along the way at the usual tourist orientated layover. 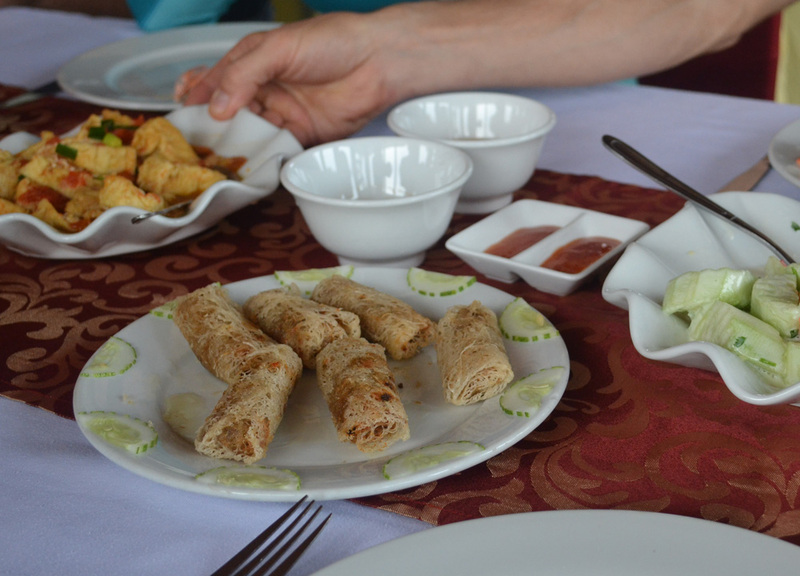 All meals are included in the Halong Bay Overnight Cruise meaning set meals and set times. As an independent traveller this is a nightmare for me. Sitting politely, sharing plates, not wanting to be the guy who ate the last spring roll (I was the guy who ate the last spring roll). Not being able to pick and chose my own food is hard. Most foods were mild with generous servings of veg and fish. No fiery chilli dips or chunky meat dishes to get my teeth into. After each meal I was forced downstairs to snack on contraband biscuits. The group we travel with is a mixed bunch; a bunch rarely found on backpacker trails. This is why we pay the extra. In total 13 travellers and while we generally avoid chit-chat it was hard not to be drawn in by traveller tales. To be specific seafaring tales of a retired Canadian man and his son. Travelling open seas for up to 3 weeks with no sign of land. Navigating their live aboard boat through 50+ countries. Fascinating stories. Fishermen bashing their sides at night along coasts of Somalia and Yemen. Did you know guns and ammo are good for trade in some countries? Larry advises against because of escalated standoffs with pirates and lengthened quarantine times at ports. Again… fascinating. Tubing tales of the Mekong don’t really suffice. Others in the group include a couple from Northern Ireland (my home country), a guy from Buenos Aires with a top notch moustache and an older Mongolian couple. We get the rare photo op of me and Fanfan together (awk). Something we should have prepared for. After boarding the bus you will find few opportunities to pick up snacks and booze along the way. As expected drinks on board come at a hefty markup and on top of this a service charge is added to drinks brought on board ($1 per beer or soft drink and $10 for hard liquor). We are therefore forced to smuggle contraband. 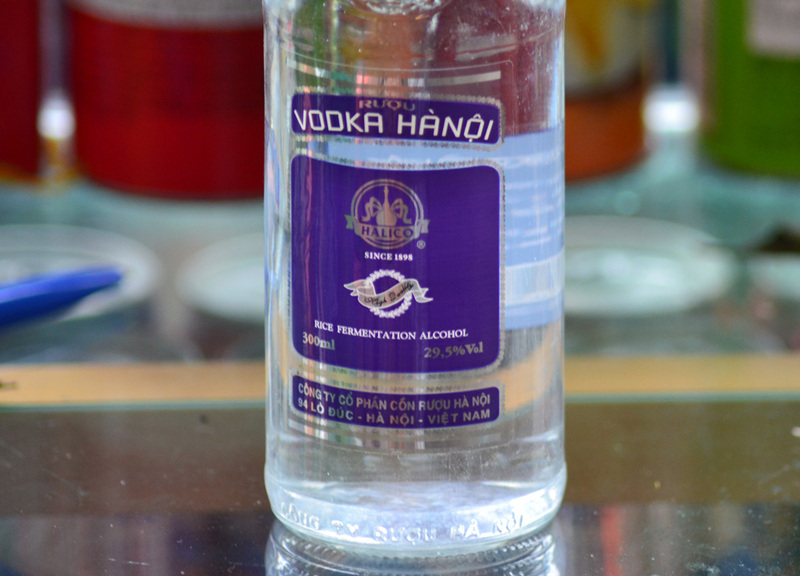 Fortunately you do find small boats along the Halong Bay tour and I manage to smuggle on board a bottle of Hanoi Vodka (70,000 Dong). Expect an upward climb to reach Surprising cave but it is a climb well worth taking. Surprising cave is easily the highlight of the stops along Halong Bay. I won’t spoil the surprise for you as I am still uncertain of it myself (I was the straggler of the group). This stop lasts roughly one hour with the options of kayaking or not kayaking. I chose the not kayaking option. Instead I sit back and watch local life at the surrounding floating village. Fanfan is more adventurous here and chooses the kayaking option, jumping in with a lone Malaysian guy to circle the village. She comes back wet. For the more adventurous again kayaking to the nearby Luon Cave looks worthwhile. So there is an impressive hilltop viewpoint on this island which I now regret missing. Here we again opt to be lazy and instead take in the views of tourists and rowdy pensioners lining the beachfront. Not a beach to be excited about but the views are impressive. Good luck in taking tourist free photos. We find few opportunities on the first day to be lazy with a tight tour schedule ending 6pm after sunset. At night we are free to do as we please; relaxing on deck, drinking cocktails and fishing for squid on our itinerary. The unique, island outlines can be seen in distant surrounding as well as a sea littered with overnight cruise boats. Both beautiful. Also expect karaoke. Having not been given bed covers we instead sleep under a blanket of contraband vodka and hugs. The following (second) day is more relaxed with only one attraction to squeeze in before arrival at Halong City at roughly midday. Plenty of time to be lazy. Unlike the itinerary there was no trip to Cat Ba Island. In our case this may have been swapped for Halong Bay Pearl Farm. If you desperately plan to see any attraction be sure to hammer it in at the beginning. While I generally hate these forced tourist traps the Halong Bay Pearl Farm was more interesting than expected. Full post to come. Thanks. A. Helpful as I’m contemplating a boat trip to halong bay. Had no idea that they charged a surcharge for bringing your own drinks! Im traveling myself to vietnam this winter. Was wondering if you could share ur experience about the tour ops you opted.. ( saigon cafe travel), for i think im picking the same people for my 6 day trip..
Would love the feedback, as im finding it hard to find reviews about this operator. -is an overnight cruise really worth it? or is a day cruise sufficient to take in the beauty? Hi Gene. The day tour should be fine but it will be limited in length and views and you will be surrounded by everyone else who is on a day-tour. The overnight boats were busy enough. Personally I preferred the sleeping out on a boat and the night experience, over the views themselves. I guess both have their advantages. A.
Hi Allan, did you book with Saigon Cafe Travel online or in Vietnam? The tours on their website look fantastic but I can’t find any reviews whatsoever! !